Following up on yesterdays post “Is Israel Controlling the Internet” today we will learn about Israel’s Government and the IDF attempting to censor and control the internet, face book, you tube and many other social networks, blogs, message boards and news organisations. Today I will be discussing these groups who work online for Israel and the IDF (Israeli Army). These groups came about after the many genocidal murders committed by Israel and the IDF. Hundreds of Lebanese, Palestinians being killed, with the majority of them being innocent civilians, women and children. Israel need helps to re-create its image worldwide. What better place than the internet? Why the internet? Because the internet is a huge echo chamber. It also influences what news you see on your television or MSM news sites, like CNN, ABC, MSNBC and CBS for instance. It also influences what you read in your newspapers worldwide. With today’s 24 hour news cycle, the need for fresh news is quite important for retaining viewers and readers. So, many news publications and organisations turn to the internet to see what the “buzz” is and then report on that. Also, due to the internets wide range of people and access to webcams, videos and blogs, many times regular individuals get important news online before main stream media does. Given these facts, who ever controls the internet controls the news and controls the battle for the hearts and minds of the general public. Hence the creation of JIDF and GIYUS. Now lets look at the other group called JIDF, e.g Jewish Internet Defense Force, sounds very miltary doesn't it now? 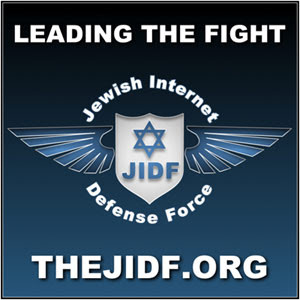 "One of their campaigns has already led to 106 Facebook groups being removed"
The Jewish Internet Defense Force, (JIDF) is approximately 8 years old as a collective of activists and has operated under the name the "Jewish Internet Defense Force"
But, it gets even better, and here’s another one, this is a RAP music video showing news footage and photos of those killed by Israel, again, we can’t let the world see this, they might not like us!! In general, please alert us to any problems of POV-Pushing, bias, subtle antisemitic jabs and the standard "Jew baiting" so commonly found on Wikipedia (WP), so we may update this list and continue cite specific examples. We are also looking to get a lot more active on Wikipedia, since much has been written about the problems and many people have pointed out unfair Wikipedia policies and implementation thereof, especially with regard to Israel and the Jewish people. "Just look at this user's userpage. Wikipedia is supposed to have rules against using it for "soapboxing" but apparently they make an exception in this case"
They even invented software to use to make their censorship work easier, it is called “megaphone”, and endorsed by the IDF (Israeli army) and government! The Megaphone desktop tool is a Windows "action alert" tool developed by Give Israel Your United Support (GIYUS) and distributed by World Union of Jewish Students, World Jewish Congress, The Jewish Agency for Israel, World Zionist Organization, StandWithUs, Hasbara fellowships, HonestReporting, and other pro-Israel public relations, media watchdog, or activism organizations. The tool delivers real-time alerts about key articles, videos, blogs, and surveys related to Israel or the Arab-Israeli conflict, especially those perceived by GIYUS to be highly critical of Israel, so that users can vote or add comments expressing their support of Israel. The tool was released in July during the 2006 Lebanon War. In the JIDF's latest efforts, the group has been working around the clock to dismantle the group on Facebook titled, "Israel is not a country! Delist it from Facebook as a country." That group had tens of thousands of members. Facebook's negligence and abdication of responsibility gave us no option but to take matters in our own hands," the JIDF added. The JIDF received a response from Facebook, he said, which called the anti-Israel group "legitimate political discourse." Facebook was not available for comment. "[The JIDF] gained control of the group without compromising Facebook's security," Oboler said. "What they have done... is taken away the hate that was spreading through [the group's] membership. It's a shame that Facebook themselves did not remove it. It has taken a lot of effort from [the JIDF], while it would have taken Facebook one click." So what group or site will they come for next? If you say anything negative about israel on your cell phone, you will be targeted also. It happened to me in 2006 after a few months of voicing my opinion to friends and family. An attractive israeli man insisted on being my "boyfriend", I was intrigued enough to get to know him better and introduce him to my family, etc. He even wanted to walk my very large dog. About a month later, I was robbed of everything of value in my house. He was there to be my "savior" afterwards, but took off right after that. If you look up the "48 Laws of Power", Law 5 says "So Much Depends on Reputation – Guard it with your Life"; this explains some of the denying that goes on. When YouTube had a contributor who noticed the the collapse of WTC-7 was being announced b-e-f-o-r-e it actually happened, that company was promptly bought out. All of this happens in the light of Bernie Madoff not being locked up, etc., etc. If that doesn't look dirty, what does? Personally, I think it shows exactly what the removed writers were talking about. They have a hard job ahead of them for sure. What with the hundreds of images of dead children and the huge numbers of innocents they targeted. I believe they have finally gone too far, the world has had enough, they have lost the hearts and minds of the general public. Lets hope this causes the American government to stop handing over Billions to them so they can keep murdering people and behaving like thugs. When I visited this site a few minutes ago, my Internet connections all shut down. Now, I am able to post this comment, but I am suspicious. I hope you will not be attacked by these Zionist internet thugs, such as the ones that are harrassing another group you and I are in, Ban Sidhe. When I came to this site a few minutes ago, my Internet connections all shut down. I hope that you are able to maintain this blog inspite of the Zionist thugs that infest the Internet. God bless you always, Ban Sidhe. And thank you for informing us of this...... all though we always suspected it. Tannie, thank you for visiting. The JIDF site says it changes the URL's for it's pages regularly, because people discover them. So just go to their site and look around, there will be a page where it will list the You Tube Vid's they are targeting. benchmark of our democracy, without which we would be heading toward what we criticize in other countries, especially Communist ones, but many others as well. The purpose was for those B'nai B'rith students and other such organizations to focus to stop any speaker from coming on campuses unless they were pro-Israel. Ironically, I do not know anyone who ever saw a group supporting Palestine rights, trying to stop people with a different opinion. Never. Since our country sends billions of $ to Israel, people need to learn more about it and have every right to question why billions go to a rich, nuclear armed country not needing aid. Right now, while building is suffering in the US, contractors out of a job, hundreds of "settlements" are being built in illegally occupied parts of Palestine. Especially now, people are asking why so much money is being wasted, tax dollars unaccounted for when that money is needed in America for Americans during a financial crisis. The pro-Israel students don't give a whit about that. And one ploy to try to throw you off guard is asking why not criticize what happens in Liberia or the Sudan or where ever? The answer is simple. The US is not sending billions yearly to those places and contributing to those crimes. The US is sending billions to a country building on confiscated lands, lands that have never been accepted by the US or the UN as anything but illegally occupied. Gaza. West Bank, E. Jerusalem or the Golan Hts. That is a fact. So why is that being done? Because the special interests like AIPAC and others pad the pockets of our corruptible politicians with millions of dollars to sway their votes, alienating the rights of the rest of us, so our votes do not even count on those issues. Special interest bribes. And those should be banned for what they are. Bribes. What Israel does, collective punishment, apartheid system of governing, abuse and humiliation of children, long, inhumane curfews, confiscation of lands and homes belonging to others, racism and bigotry are not legal in the United States. So why is American money being squandered on those crimes? I already said. Corruption. How to stop it? Write those elected officials and especially the president and demand those bribes be stopped. Most of our politicians are well paid and have outside professional jobs and they have benefits most Americans only dream of having. Accepting special interest money involving any foreign country should be outlawed. Hi Skeeb and thanks for your comments. Yes this is pretty serious. There is so much money and organizing in these groups, what with being backed by the government of Israel. not to mention the ones in the USA who have the backing of AIPAC as well as the huge number of other zionist groups. I could make 100 blogs on what i have already and I just keep finding more. Getting to where I really dispise the attempts to shut down alternate views by these groups. The internet has them scared to death, thank God for the internet! Oh, forogt to say that I agree with all you say in your comments. What happened in Gaza WAS a collective punishment meted out on Palestinians because they ahd the audacity to vote for Hamas, imainge them not voting for whom the Israelis wanted, how dare they hold a democratic election. Well, Israel (and the USA) need to learn you can't pick and choose who you negotiate with, you have to respect thsoe who are democratically elected, the sooner they realise that the better. It was this way here in the North of Ireland with your peace process, Israel should take note. Do you think, we should collect all the horrible picture of plaestinians at one place to counter Israeli propaganda? I mean phosphorous bomb melts human body and goes deep till bone, It has been bombed on civilians. UN hospitals and schools were bombed, I think we need to make our case strong by using same media as zionists use, except that we will show public truth and not zionist propaganda. What i really like in your blog is absense of hate, which is must to put forward truth precisely and truthfully. Good luck in you endeavour, I will pray to Allah God save us from these civilized and chosen people.